Check out the video below for a key point summary of this article, “Multi-Location SEO Web Design”. Let’s backup for a minute. If you’re not sure if your business needs SEO, check out SEO Services for Small Business for answers to all your questions, and all the info you need to make an educated decision if it’s right for your business. As any top Maryland SEO expert will tell you, an effective website structure vastly improves search engine ranking, and is critical for a successful Multi-Location SEO Web Design strategy. Multiple location businesses will rank well in multiple cities using only one website if set up properly. The website organizational structure is the foundation upon which search ranking success is built, and when implemented properly, allows us to easily scale our business. Poor website architectural structure will yield poor search ranking, and create an expensive mess for a web design/SEO expert like me to clean up down the road. So set it up right from the start. Why do multi-location businesses and franchises have a unique SEO advantage? Local businesses beat national chains and national brands in organic search results because a local business’ entire site is built around a product or service in a given market. On the contrary, national brands rarely mention the local market when advertising their product or service, making it much more difficult to be relevant in that local market. How can a multi-location businesses maximize SEO ? 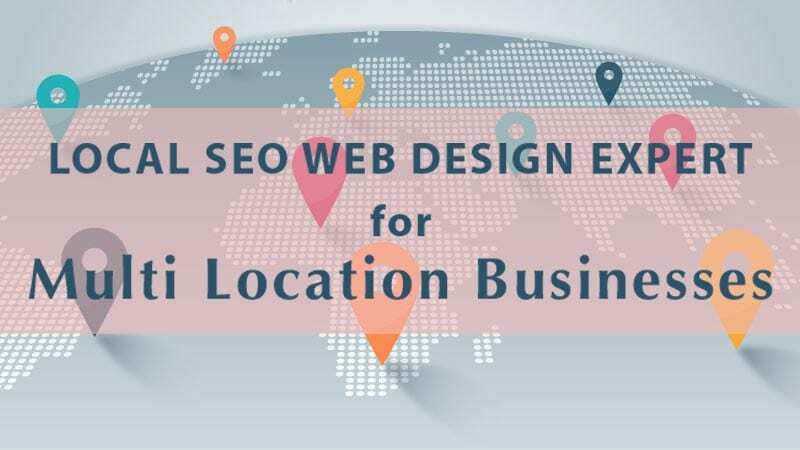 A multi-location business will maximize SEO and rank well in search by organizing the website architecture properly and using Geo-targeting. Geo-targeting is defined as the practice of delivering different content or advertisements to a website user based on his or her geographic location. 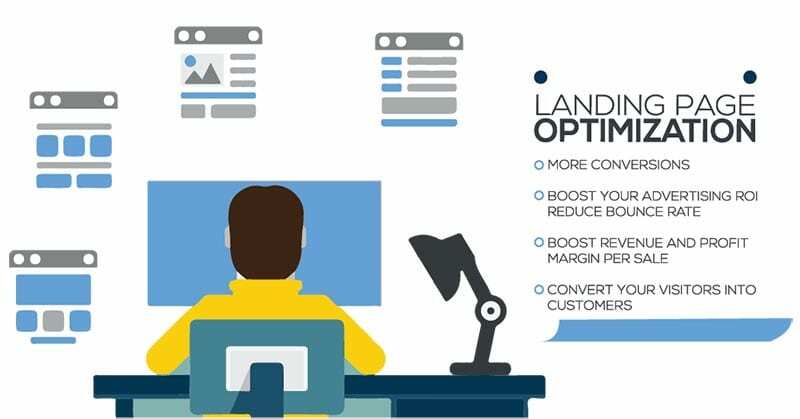 Fundamentally, geo-targeting means we provide optimized real estate online to our multiple business locations, which allows google to feed our content to users based on their local geographic location. Why is geo-targeting critical to the success of my multi-location business?Geo-targeting is critical to the success of any multi-location business because Local Search converts 4x better than any other source of traffic, and if done right, will dramatically increase your business organic search results. When a business grows to a multi-location model, web design and SEO is more complex and requires greater skill and knowledge, but the reward is great! The challenge is how to prove local relevancy to achieve rankings for each location. The ideal website structure of your multi location site uses one domain. Multiple domains dilute rankings and unnecessarily increase work load and complexity. Keep it simple. Use one domain. Within this domain, it is most common to structure the content like a pyramid with your homepage at the top, and branching out below with category pages, subcategories or custom taxonomies. Identify the highest volume keywords that you want to target. These become your top level category pages that are linked most often on your site. Next, identify the longer queries. These become your next level category pages which nest under these top level category pages. Finally, create your content in the pages. In our single domain website, we will set up much of the standard single location business website architecture for the business headquarters, such as the main nav containing links to pages such as About, Blog, Products, Services, Contact pages etc. To utilize geo-targeting seo, we will create a nav menu link to a Locations page that will list each of the business locations. On this main locations page, each business location will be linked to it’s own main location page. For example, most often it makes sense to reference each location by the city. Below we have a site structure set up for an attorney, headquarters in Rockville, MD, using one domain at mysite.com. On the locations page at mysite.com/locations, we have the main Rockville location , as well as 4 business satellite locations listed …. two in Virginia, one in Maryland, and one location in DC. 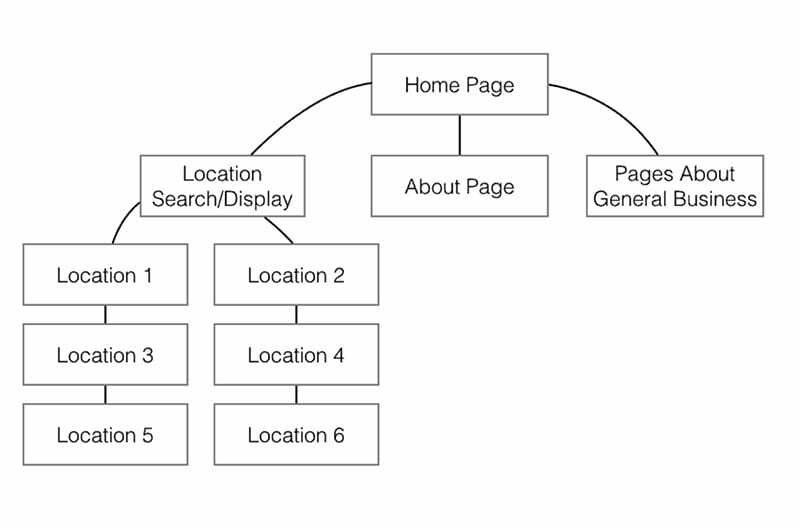 With this site structure, each location can have it’s own unique content to prove relevance. Instead of creating only a single location page for each location, you’ll now have a robust “hub” of unique local information about each city that your business serves, all still housed in the main domain at mysite.com. Each “hub” will be optimized to push out local signals for each individual city, and with additional localized blog content, and local links associated with each hub, local relevancy signals will be strong, driving leads to your site. Each of the above satellite locations get their own page, each of which will be referenced by the it’s own unique url on the main domain. Each location page must be created with great care to rank well. Location page design is very important to prove relevance. What does optimization mean? To optimize a page means to create it in such a way that it will prove highly relevant to google resulting in ranking well in search results. Optimization of location specific landing pages is like threading a needle. It requires creativity, great attention to detail, and ability to learn and follow many important rules that will govern the success of local search and eventual google ranking. Insure that city is in your title tag H1’s & alt image tags as well as in the content on the page. Create at least 500 words of unique content on each of your location pages. Some recommend 2,500 words or more long form content. Research your city page’s targeted metro area and include attributes, or data point references, landmarks, zip codes, and other key historical attributes that are unique to that specific city. It’s just as important to link from your location page to the corresponding Google My Business listing as it is for the GMB listing to link to the proper page on the website. Pages should be mobile friendly at minimum and fully mobile optimized at best. This new form of optimization is one of the most powerful, but least-utilized forms of SEO available today. Schema is a set of code or structured data, that lets search engines understand your NAP (name, address, phone) data better. 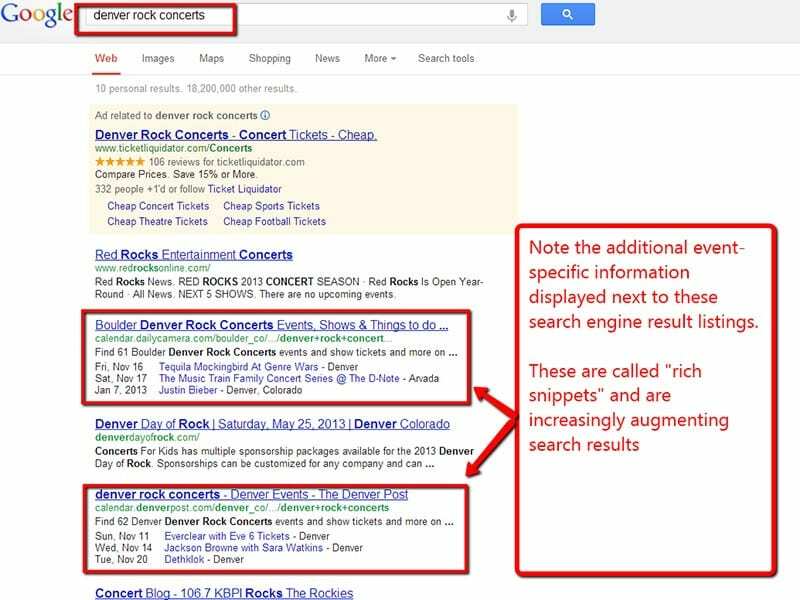 This then lets search engines present a more user-friendly display in the search results, called rich data or snippets. Embed local schema markup code for each location page on your site. I recommend using the WordPress plugin WP SEO Data, or use schema generators such as RankTank’s Structured Data Tool. Even better, adding a branded map to your website helps establish a better correlation between your Google My Business listing and your website. 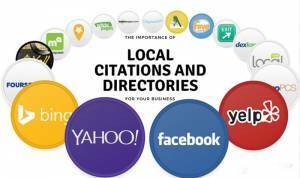 Because Google looks at your overall web presence when determining ranking, it’s important that you build links to each of your locations pages and that you submit each of your locations to citation websites such as Yelp, YP.com, CitySearch.com and so-on. If your budget allows, and you don’t want to do the citation submissions manually, it may make sense to purchase a subscription to Yext or MozLocal. Some say Google My Business is the holy grail of online business directories. We have all seen clients sometimes tripling their organic traffic as a result of creating a Google local listing. The incredible value of the listings is due to the fact that Google integrates them into search results, and typically includes them above the fold – meaning they’re the first thing a user sees when searching for a local business. These valuable Google My Business listings are often referred to as ‘local packs’. Local packs most often contain from 3-7 listings, depending on the user search query. What makes it really nice is that the business name is linked to the website so they can drive a significant amount of organic traffic. Local packs also display reviews, a link to your Google plus business page, and often include a map showing where each business is located. All of these Google My Business features help make your listing stand out in search results. For businesses with multiple locations, using one listing simply is not a good idea because it will likely result in your business losing out on the Google My Business local pack listings and subsequent web traffic that would have been generated. Consistent unique NAP (name, address, phone) for each location is important to avoid duplicate content issues and enable proper location indexing. Make sure this is your correct business name. Some businesses try to add keywords to their business name to rank higher in maps. Doing this could cause your listing to get removed completely. Some suggest using a unique business name for each location. For example, if you your business name is Smith Construction, using city-specific DBA’s, i.e. Smith Construction of Bethesda, Smith Construction of Rockville, etc. It is not necessary to have a different name for each location. The same name for each location works well. Be sure your address matches the address on the website, exactly. Sometimes Google will change certain elements of the address (like changing Boulevard to Blvd), if this happens, change the address to match the address as it appears on your Google My Business Listing. In addition, it’s critical that each unique geographic business location address is capable of receiving snail mail for Google to successfully verify the address. If this isn’t possible, your business will not receive a GMB listing for the location. Each location needs a unique local phone number, rather then a central number, whenever possible. You can add up to 5 services. Choose the ones that are the most relevant to your business. Some recommend using as few as possible to prevent brand dilution. Be sure to fill this out completely. Try to add up to 10 photos. You can use pictures of the inside of your store, staff pictures, and so on. Write unique content that is completely different than anything you currently have on your website. Be sure to list the services you offer and link those services to the proper services pages for each location. Since there is a correlation between your onsite optimization and your ranking in maps, link each GMB page to the url of the specific location page. 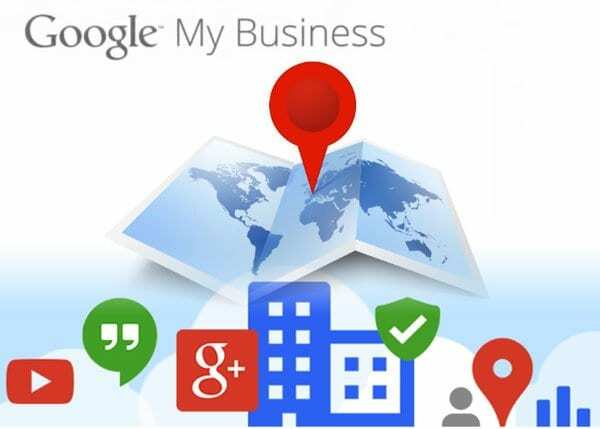 Make sure the name of the business, the phone number and the address match what is on the Google My Business page exactly. In order to rank your city page, you have to provide more value to your visitors than any other page you are competing against. The most common mistake made when creating location pages is not using unique enough content. This mistake causes the location pages to compete with each other so google doesnt know which page to serve, sometimes causing a location page to outrank the site homepage. Keyword Stuffing – Do not keyword stuff. Keep it real. What is the ideal phone listing structure, for search ranking, for your multi-location business? Funnel all calls via one main phone number, where all leads come into the main line, and one main number is pushed out on the website and social channels. Keeping calls and leads centralized may be more cost effective for the business, however this setup increases the potential for duplicate citation business listings and reduces the chances of ranking each location. Separate phone number listings for each location may be a bit more challenging to manage, but will yield clean business citations, consistent unique NAP (name, address, phone) for each location, and will result in much better search rankings for each location. I highly recommend listing a unique phone number in business citations and Google My Business for each location. This article is spot on. Multi-location business sites can be tricky, I am still working on pushing updates and separating each of my location’s citations in directories. I am currently working on building location-specific niche service pages for each location as you had mentioned.